Twilight Time has chosen another fantastic oldie. This is one of those films I find myself often returning to because of the amazing performances and the brilliant tight direction. The costumes, sets and storyline all come together to create an important piece of cinema. This has never looked any better. Twilight Time did an amazing transfer in audio and video. Another perfect, flawless product. Another must own experience. First off I would like to start by mentioning two things. First this stars one of my all-time favorite actresses in all of the movie business. The one of kind, beautiful, stunning, masterly talent of Ingrid Bergman. She was apart of so many flawless pieces of cinema. From the 1942 masterpiece Casablanca, to the amazing mystery suspense’s of Alfred Hitchcock’s 1946’s Notorious and 1945’s Spellbound. What is interesting about the legacy of Bergman’s mastery, is she is connected to one of my favorite directors of all time Victor Fleming. Fleming would direct three of my favorite movies of all time: Gone with the Wind, The Wizard of Oz and Captain Courageous starring one of the greatest child actors of all time Freddie Bartholomew. Victor would go on to direct Ingrid Bergman in 1941’s Dr. Jekyll and Mr. Hyde, and the often over looked 1948’s Joan of Arc, which is the connection to the stunning beautiful Ingrid Bergman I want to mention. During this time period Bergman had a passionate love affair with Italian film director Roberto Rossellini, that affair lead to the birth of another one of my favorite actresses, the fantastic Isabella Rossellini. This affair would cause a great stain on Bergman and Rossellini, basically breaking up both of there marriages, and also on the film Joan of Arc, causing much hatred toward the film and also Bergman. Sadly, one week after the premier of Joan of Arc, Victor Fleming died of a heart attack. Bergman was, an is one of the greatest to ever capture her presence on screen. Her role in Anastasia is a prime example of the brilliance of performing. She was the golden ticket of acting perfection. The second thing I want to mention is I have always been utterly fascinated with the legacy, legend, myth style story of the Romanov family and their mass murder. Did Anastasia survive or was she killed? More or less she was killed and history states that through evidence, but like most odd cases there is always the fancy and hope that she lived. This has always been a subject matter of films, documentaries, countless books and even animated films. This 1956 movie is one of the grand features to bring this subject to light. It’s a fantastic movie with equal parts history, drama and biography. Bergman’s acting garnered her an Oscar win for her role and she so deserved it. Her performance in this, is one that stands out even today. Her glory and mastery shined in this role. To me this is an important piece of cinema that expresses the mastery that film can be. The plot takes place 10 years after the murder of Nicholas the 2nd and his family. A woman who has amnesia is in a hospital. The place is France. White Russian General Bounine (played flawlessly by Yul Brynner) notices the stark resemblance to the supposedly dead Grand Duchess Anastasia. There he derives a plan and scheme to swindle the inheritance of Anastasia who is rumored to have survived and gotten away. There Bounine grooms this amnesia victim to further his plan, to use her as the real Anastasia. 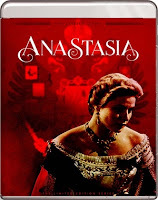 The plot thickens as Anna the so called Anastasia displays more truth then fiction. The question is, is Anna the real Anastasia or is she just an average lady. Directed by a wonderful Academy Award nominated director. An amazing film creator, Director, producer and writer Anatole Litvak. Responsible for some of the great cinema, including 1940’s All This, and Heaven Too, 1948’s The Snake Pit, 1951’s Decision before Dawn, 1967’s The Night of the Generals (which might I add was also a Twilight Time Special Edition Blu-ray release which you can read my review HERE). All his films had a flare of masterly direction. This is another fantastic film brought out in a whole new setting, by a wonderful company that knows how to treat films. This has never looked any better. I was absolutely amazed at how brilliant this Blu-ray was. The colors stand out and are amazingly fresh, vibrant and the high definition is breathtaking. Perfection yet again. The sound is equally impressive. Crisp, spot on listening ear candy. Isolated Score Track. You have a multi-of talent on the music in this film, composer of perfection. Alfred Newman. Alfred Newman was another pioneer of music. A composer and arranger and conductor of many, upon many pieces of music for film. The vast array of work under his belt can only show you his expertise at music, from, The Song of Bernadette, All About Eve, The Diary of Anne Frank, How the West Was Won, The Greatest Story Ever Told and many, many more credits to his name. What’s so different and amazing about Newman is, he only wrote music for film. This idea and concept showcases the beauty he had for film and that beauty always showed in the finished product. I have to mention the success of his music was honored countless times, winning an impressive 9 Oscars and being nominated over 40 times. Audio Commentary with Film Historians Julie Kirgo and David Del Valle. All one has to do is hear these fantastic commentaries thick with amazing film historians. Kirgo and Del Valle are truly knowledgeable and always is a fantastic listen. Another spot on commentary for any film lover. Audio Commentary with Screenwriter Arthur Laurents, Actor James MacArthur, and Film Historians Jon Burlingame and Sylvia Stoddard. This was a true treat to hear. Always a fantastic experience hearing the reality of those involved with the film world. A perfect listen. Another masterly product. A fine example of how to treat an older film and bring it out in High Definition. A classic film with flawless performances and a perfection in direction. Twilight Time has honored this film in a way that no others can. A perfect Blu-ray, highly recommended.